Located in the leafy area of Bowdon, The Stamford is a modern interpretation of pubs from a bygone era; a social space enjoyed by the local community and visitors alike serving the wider Altrincham, Hale and Cheshire area. We offer a dining space with an open kitchen at the heart of the restaurant operation alongside a proper pub atmosphere. Whether a quick pint or bite after work, romantic meal for two, special celebration, or a few hours sat in our sunshine garden, we have a space to accommodate all in this community focused pub made with love. The Stamford encompasses a number of distinct spaces - each a concept to themselves - all designed to compliment each other and ensure a venue for all occasions. In this area it still remains a 'pub pub'. We operate all tables here on a first come first serve basis, there is no time limit on pub tables, no requirement to eat, and well-behaved dogs are welcome. Feel free to while away a few hours with the morning papers, natter with friends, delve into our chest of retro board games or enjoy a bite to eat by the fire. With access out front to over 100 seats in the sunshine this is definitely the go to place on a fine summers day. Although our menu is available throughout the pub, our main dining room is all about the food. With the theatre of our open kitchen backlighting the room we feel this is the best place to enjoy our fayre. Re-imagined to create a more vivacious atmosphere, with a huge centre-piece Chesterfield in Stamford green framing the room. There will be live music to dine to every weekend and a soundtrack of funk, northern soul and Brit pop mixed exclusively for us by our resident music expert Conan Liquid played through a state of the art Funktion One sound system. Prior reservation is recommended and on a first come first serve basis. 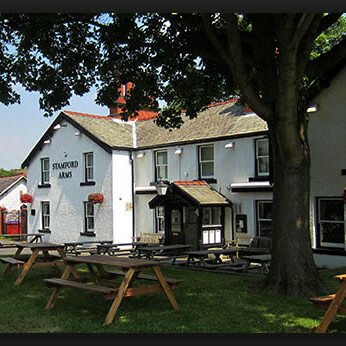 We're really sorry but we don’t seem to have any offers or events for Stamford Arms. We're sure there must be something happening here but they just haven't told us about it! Please do mention this to Stamford Arms when you next visit them.